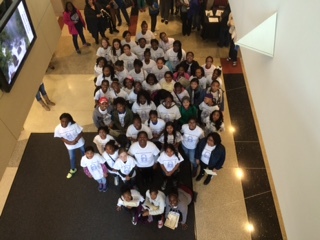 More than 70 female middle school students took part in the Maryland Cybersecurity Center’s (MC2) Sixth Cybersecurity and Cybersafety Workshop for Girls Oct. 17. All female participants ranging from sixth to eighth grade were from Maryland, Virginia, and the Washington, D.C. area. Students arrived eager to learn about the meaning of cybersecurity and how Internet safety and security impact their everyday lives. After an introduction ceremony and some icebreaker activities, students were separated into smaller groups that rotated through four stations throughout the day. Participants were challenged to work together and use their cyber knowledge to participate in interactive activities. Each station was led by enthusiastic UMD undergraduate students, most of whom are students in the Advanced Cybersecurity Experience for Students (ACES) program or computer science or engineering majors. Some of the activities included cryptologic and code breaking, creating strong passwords, determining information that is available on the internet, and protecting your computer and social media by understanding privacy settings. At the end of the program, each group presented a poster on their last activity of the day. Parents and family were invited to the closing ceremony where participants presented their creative poster and received a certificate for the workshop. This program is one of many educational outreach programs offered by MC2, all designed to encourage young students to pursue cybersecurity and other related fields. Future events for elementary, middle and high school students can be found here.